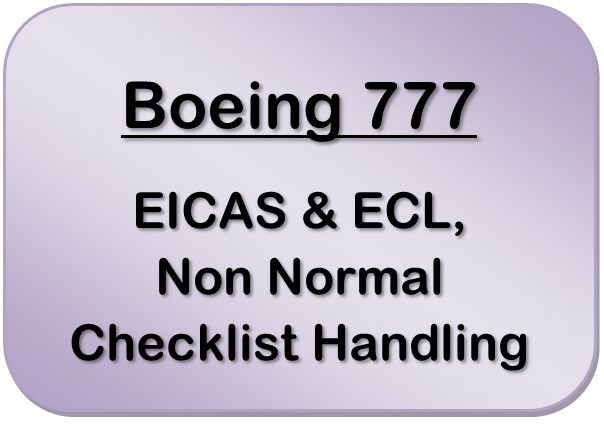 Some time ago I wrote down all that I had been taught and learned about operating the Boeing 777 Electronic Checklist (ECL) in conjunction with the onboard Electronic Indication and Crew Alert System (EICAS). I’ve updated it along the way as I became an instructor and it’s become more and more of a formal document along the way. Now it’s here on Infinidim. The disclaimer below says it all – read at your own risk. If you have any comments, corrections or suggestions, please let me know in the Comments at the bottom of this post. 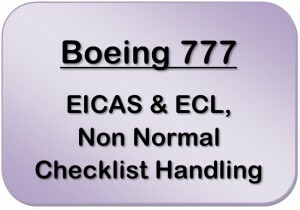 EICAS (Engine Indicating and Crew Alerting System) is the centralised system for monitoring the normal (NM) and non-normal (NNM) status of modern Boeing aircraft. It is a one stop shop for engine indications and crew alerting and in combination with the Electronic Checklist (ECL), providing a human centric set of problem solving tools for modern aircraft. This document does not seek to explain the basic mechanics of EICAS or ECL and assumes that you already have the relevant systems and procedural knowledge from the Boeing FCOM, QRH, FCTM and some practical experience. Instead here I explain the philosophy behind EICAS and ECL, providing a consistent framework for all crew to use as a basis for handling EICAS messages, ECL NM and NNM checklists and NNM events in a consistent manner, using the best practice CRM/NTS principles of the modern multi crew cockpit. You will also find some handling tips that have come from experience with the aircraft. You may find some of the procedures and techniques documented here somewhat pedantic and stilted, but they are intended to produce a level playing field in the handling of NNM events across crew of varied language skills, company cultures, experience levels and degrees of fatigue – these procedures become second nature with repetition. Note that nothing in this document should be considered authoritative over any procedures found in the Boeing Normal Procedures (NP’s). The NP’s and your airline Flight Operations Manual document are overriding. Finally, note that while most of the contents is applicable to all 777 models, a few items (such as 5.9 Engine In Flight Start Envelope) are specific to the B777-300ER with GE90 Engines. This document is based on extensive research and operational experience of the Boeing EICAS/ECL found in the 777, in conjunction with documented procedures in the Boeing 777 QRH, FCTM and FCOM. Material incorporated in this guide is taken from all three of the relevant Boeing documents, as well as Boeing publications from issues of Airliner magazine and other sources. As such this document is to be regarded as secondary in precedence to all these reference texts and should not be actively referred to with respect to operation of the aircraft. Additionally this document incorporates techniques that have been developed and tested in conjunction with Simulator Training but not validated in operation of the aircraft, and must be read with caution.